Hastings Athletic Club expects to field possibly its largest ever squad in the Sussex Cross-Country Championships this coming Saturday. And despite a number of runners struggling with illness, the club has high hopes of success in many of the various races over what’s expected to be a fairly sticky course at Bexhill Down. 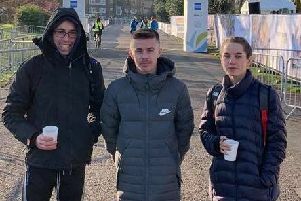 George Pool, who is due to return from holiday in the Alps on Saturday morning, is probably the favourite for the under-17 men’s race, with the in-form Isaac Elam also expected to go well. Carlos Nieto-Parr is a strong contender for victory in the under-15 boys’ event, while Shannon Hopkins-Parry and Maya Ramnarine could make the top five of the under-15 girls’ and under-17 women’s races respectively. With Caitlin Millar and Rachael Mulvey contenders to make the top 10 individually, Hastings AC appear to have a real chance of success in the senior women’s team event. Gary Foster could make the top 10 in the senior men’s race and St Leonards-based Ross Skelton, of the Brighton Phoenix club, is likely to finish in the top three. Race schedule: 11.10am under-11 boys; 11.20am u11 girls; 11.30am u13 girls; 11.45am u13 boys; 12noon u15 girls; 12.20pm u15 boys; 12.40pm u17 women; 1.05pm u17 men; 1.30pm u20 & senior men; 2.25pm u20 & senior women.